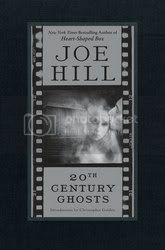 I think it's a rare thing to be able to find a collection of ghost stories that have true heart and soul behind them, but that's exactly what you'll find with Joe Hill's collection, 20th Century Ghosts. Don't get me wrong, you'll find your typical, run-of-the-mill ghost story here, but there still seems to be something in the background of each story that makes it more than just that typical ghost story. My favorite of the lot would have to be the title story, "20th Century Ghost". It is such a unique and honestly touching ghost story, that I actually went back and reread that particular story a couple of times over as I read through the other stories. Joe Hill has proven himself as a solid writer who doesn't have to use his father's celebrity at all to propel himself (his father is a writer a few of you may have heard of before, Stephen King). I'm looking forward to reading more of his work. Today we celebrate William Shakespeare's birthday (1564). 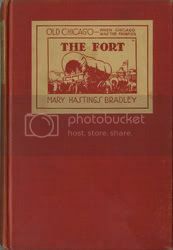 This was quite a find for me; at our first biannual antiquarian book show this year, I stumbled upon a 4-volume set of historical fiction novels by Mary Hastings Bradley about the city of Chicago. Anyone who knows me well knows that I have a love affair with the city of Chicago. I'm usually down there about every other month or sooner, and can never get enough of it. I try to find what books I can about literary Chicago, too, so this was a real treat for me. I haven't gotten around to reading the other 3 in the series yet so I don't know if they follow the same format, but I felt that we are more or less dropped into the middle of the story in The Fort, where we meet Barry John at Fort Dearborn, a mere few days before the Fort Dearborn Massacre of 1812. The evacuation has been announced and the soldiers and their families are getting ready to leave the Fort. Barry John is not an American soldier, but rather an English soldier who is helping the Americans. He is being courted by a squaw of one of the local Indian tribes, who is trying to get him to marry her and escape the battle. This is where, for one quick moment, I was afraid the story was roaming in romance territory. I was wrong. He decides to hold his ground with the Americans and evacuates with them, only to be ambushed with the others, just barely surviving the attack, when he is rescued by the squaw. Mary Hastings Bradley actually does an admirable job of describing the ambush and subsequent massacre, not really holding back at all in the bloody descriptions of the battle and the treatment by the Indians of the survivors of the attack. I'm not entirely familiar with all of the historical facts surrounding the Fort Dearborn Massacre, but it would seem that Bradley did her research before writing this short novel, and I'm interested to see how well the other three volumes hold up. Recommended if you're interested in the history of Chicago; otherwise, it may not hold much interest for you. Most any young girl who is a fan of horse books will recognize today's birthday celebrant, Marguerite Henry (1902). I've been thinking about playing around with my blog's look lately, and would like some input on what I've got so far. Post a comment and let me know what you think. Thanks! Probably best known for her Ramona series, today is Beverly Cleary's birthday (1916)! Follow this link to see this years Pultizer Prize winners. Follow this link to see a list of the 2010 Hugo Award nominees. Well, that's it for Dewey's 24 Hour Read-a-thon for me for today. I need some sleep. Three books, 2 short stories and part of a fourth book is a fairly decent turnout for my first time doing the Read-a-thon. If I can get up early enough in the morning, I'll try to finish my fourth book, Agatha Christie's The Moving Finger, but for right now, I must answer the siren call of my bed. Thank you to everyone for stopping by today and to my cheerleaders for cheering me on! It's been a great experience, and one that I know I will participate in again. You are thousands of years old. You have amazing powers. You have watched civilizations rise and fall. So why does no one remember any of this? Bestselling Author Neil Gaiman (Marvel: 1602, Anansi Boys, Sandman) is joined by superstar artist John Romita Jr. (Amazing Spider-Man, Wolverine) to present a tale that will change the Eternals and the Marvel Universe forever! Collects The Eternals #1-7. I really enjoyed this graphic novel. 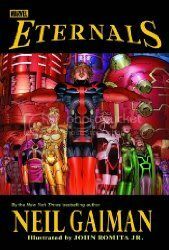 Neil Gaiman did a really admirable job of updating the history of the Eternals, but still remaining faithful to the already existing mythology that Marvel built around them. If you are a new reader to the Eternals, you wouldn't feel lost, and if you are an old fan, you won't feel that the story has been changed all that much. John Romita Jr's art is spot on, as always, and his dynamic style fits the tone of the story perfectly. A calico cat, about to have kittens, hears the lonely howl of a chained-up hound deep in the backwaters of the bayou. She dares to find him in the forest, and the hound dares to befriend this cat, this feline, this creature he is supposed to hate. They are an unlikely pair, about to become an unlikely family. Ranger urges the cat to hide underneath the porch, to raise her kittens there because Gar-Face, the man living inside the house, will surely use them as alligator bait should he find them. But they are safe in the Underneath...as long as they stay in the Underneath. Kittens, however, are notoriously curious creatures. And one kitten's one moment of curiosity sets off a chain of events that is astonishing, remarkable, and enormous in its meaning. For everyone who loves Sounder, Shiloh, and The Yearling, for everyone who loves the haunting beauty of writers such as Marjorie Kinnan Rawlings, Flannery O'Connor, and Carson McCullers, Kathi Appelt spins a harrowing yet keenly sweet tale about the power of love -- and its opposite, hate -- the fragility of happiness and the importance of making good on your promises. The Underneath is a powerfully written story about family, whether it is your family that you are born to or the the family that you choose for yourself. It is a story about promises. It is a story about anger and revenge. It is a story about redemption. It is a story filled with too many chapter breaks. Did that last sentence feel a little out of place? That's how I felt about the frequent chapter breaks in the book. The book is 311 pages, with 124 chapters. Some chapters are as little as one paragraph. It seemed very unnecessary in many cases, and became very distracting, breaking up the story too many times. However, the story itself is still very powerful and touching. You know you're reading a good book when the villain does something extraordinarily evil and you just want to hit him yourself. Several times over. The message about keeping your family close, whoever that family ends up being, and about keeping your promises, is told very well, the two messages intermingling throughout the story. 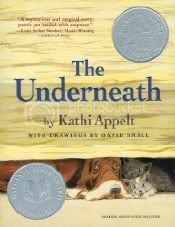 I've finished book two for Dewey's 24 Hour Read-a-thon, Kathi Applet's The Underneath. 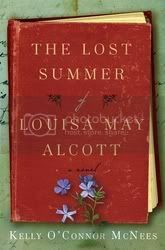 I found it to be a haunting story of family, but the frequent chapter breaks pulled me out of the story too many times. Even so, a fantastic book. Up next, another story from Joe Hill's 20th Century Ghosts, and then I think on to Agatha Christie's The Moving Finger. I want to thank everyone for stopping by and to my cheerleaders for their support. 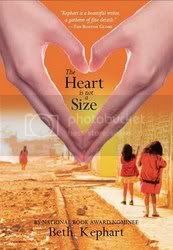 I've finished my first book for Dewey's 24 Hour Read-a-thon, Beth Kephart's The Heart is Not a Size. It's a YA book about friendship, and how, in Beth's words from her Acknowledgments, "we need truth tellers as our friends." I'm looking at my pile of books, and I'm not sure what I'm going to move on to next. I'm going to run my errands and see what book is calling my name when I get home! Georgia knows what it means to keep secrets. She knows how to ignore things. She knows that some things are better left unsaid... Or are they? When Georgia and her best friend, Riley, travel along with nine other suburban Pennsylvania kids to Anapra, a squatters' village in the heat-flattened border city of Juarez, Mexico, secrets seem to percolate and threaten both a friendship and a life. Certainties unravel. Reality changes. And Georgia is left to figure out who she is outside the world she's always known. Beth Kephart paints a world filled with emotion, longing, and the hot Mexican sun. The Heart is Not a Size is a quick read, but one that is filled with amazing imagery and prose. It is something that I am constantly impressed with by Beth Kephart, how she can capture so much beauty in her writing with just a handful of simple words. The story follows two best friends, Georgia and Riley, as they travel to Anapra with a group of fellow students and chaperone's to help build a bathroom for the small squatter village. While there, their friendship is tested as a result of keeping too many secrets. Beth Kephart says it best in her Acknowledgments, "we need truth tellers as our friends." I'm taking a quick break from the Dewey's 24 Hour Read-a-thon. Just a short one, mind you, but a necessary one. A guy's got to eat breakfast right, and what's better than birthday carrot cake for breakfast? Anyway, I thought I'd finish up Joe Hill's 20th Century Ghosts first off, but decided, in order to mix up the day a little, that I would read one story from the collection between each book that I read, so I've now moved on to beth Kephart's the Heart is Not a Size, and I've finished about half of that so far and am really enjoying it. I've got myself nicely nested on my couch right now, with my coffee and stack of books, a pile of pillows, some good reading music in the CD player and a couple of bags of snacks for later (some almonds and some chips). I'm going to admit to leaving the house after I finish The Heart is Not a Size, as I have a couple of errands that I do have to run today, but then I'll be back and reading strong for the rest of the day! How many books do you have in your TBR pile for the next 24 hours? About 10, as I don't really know what I'm going to be in the mood for. I've got plenty of books around the house if those don't work for me. Do you have any goals for the read-a-thon (i.e. number of books, number of pages, number of hours, or number of comments on blogs)? Basically, the only goal I have is to get through the 4 books I'm in the middle of now, and then work my way through what I've got here. I want to read books that I've got set aside for Challenges to help me get caught up today. If you’re a veteran read-a-thoner, Any advice for people doing this for the first time? Nope, this is my first time, so no advice from me! 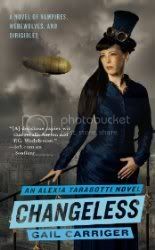 Penelope Przekop's Aberrations was one of my top reads in 2008. Please take a minute to stop by Penelope's blog and read a little about her amazing book. He lurked in the shadows of the Paris Opera House--a man with the voice of an angel but the face of a monster. His only hope for love is a beautiful soprano who draws him... to disaster. I really had no prior knowledge of The Phantom of the Opera beyond the Lon Chaney film version and the Broadway production. The film version always had that wonderful, macabre feel to it and still felt like I was missing something, and I left the Broadway feeling not entirely fulfilled (Honestly, it was the chandelier scene that ruined the whole thing for me. Everybody kept going on and on about how fantastic and unbelievable the chandelier falling was, and all I could think when the scene finally happened was that the chandelier was falling so slowly that my 89 year old grandmother could have gotten out of the way of it. To me, there was nothing spectacular about that scene.) When the film version of the Broadway production was released, I enjoyed that a little more, but I still felt like there needed to be something more to the story. Perhaps I should have read the original a little sooner and I could have had that void filled. Gaston Leroux's story is filled with all the elements that I felt the story was missing; the mystery and the Gothic flavor that I felt had been lacking in the other versions of this story that I had seen before. And, for something that was written almost 100 years ago, the story held up very well and didn't really feel all that dated to me. The background details of the Opera ghost's early life also helped me to understand his passions better than any other previous version, as well. I don't know really what else to say; I'm sure most are familiar with the story: the Opera ghost, who is horribly disfigured, lives in the sub-levels of the Paris Opera House and has fallen in love with Christine Daaé, whom he has been secretly teaching to sing. Christine is enthralled with him, thinking him to be the Angel of Music, as she has never seen the Opera ghost herself, just heard his voice. She is in love with the Viscount Raoul de Chagny, and when the Opera ghost discovers this, he kidnaps her and takes her to his home underneath the Opera House, but Raoul comes to her rescue. The stage production ends a little more dramatically than the book does, but I think I liked the ending to the book better, actually. It seems to fit the tone of the rest of the book a little better, in my opinion. Overall, an enjoyable read. Alexia Tarabotti, the Lady Woolsey, awakens in the wee hours of the mid-afternoon to find her husband, who should be decently asleep like any normal werewolf, yelling at the top of his lungs. Then he disappears - leaving her to deal with a regiment of supernatural soldiers encamped on her doorstep, a plethora of exorcised ghosts, and an angry Queen Victoria. Oh, Gail Carriger; I'm having a love/hate relationship with you right now. Well, maybe hate is too strong a word. I simply loved Soulless, but Changeless left me wanting. Wanting what, I'm not quite sure, but wanting something more. Don't get me wrong, Changeless had all the elements that made Soulless such a great read, but that's just it; it was all the same. I think the book suffered from what I call "Second Book Syndrome;" where the sophomore offering in a series still hasn't quite hit the stride of the rest of the series and is more or less riding on the coattails of the first book. I have all the faith in the world that Blameless (released in September) will make that hurdle and keep the story moving along. We have all our favorite characters from Soulless with the introduction to a handful of new characters who may or may not have the best interests of Alexia Tarabotti at heart. Ivy Hisselpenny has a slightly larger, if not more empty-headed, role this time around (seriously, a good title for a book of her own would be Witless or Senseless). I did find that Alexia's immersion into the pack hierarchy was handled very well; I felt that her character has had some honest growth from the first book to this one in that respect. The cliffhanger ending I didn't feel was entirely necessary, but since that seems to be the way of the literary world these days, it doesn't leave me entirely surprised. The entire element of the cliffhanger could have been left off for a couple of more books, and that's all I'm going to say on that subject. All things considered, Changeless is still a fun read. It may not entirely hold up to Soulless as a whole, but it's a good companion and leads nicely, if not a little abruptly, into the next book. If you have already read Soulless and are wondering about Changeless, I might say to hold off until later in the year when Blameless is released, but don't let this review of Changeless dissuade you from reading Soulless. They are both clever, fun books that will leave you laughing out loud on several occasions.